It has become very fashionable decorating wedding halls with very different to the traditional color, white, if you are a bride who like to break with the tradition of light colors and risk for something more innovative, the following article might be useful. 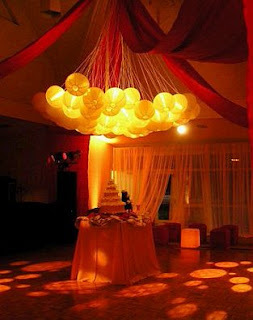 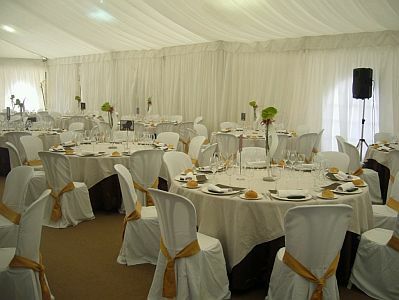 It is a series of proposals to decorate the halls or wedding, all with yellow details. In this first image you have yellow floral arrangements that are the perfect complement to the dishes and walls the same color. Sometimes you just need to use the right color of curtains to achieve the visual effect you want, this is a good example, yellow curtains give it that touch you wanted to lounge. 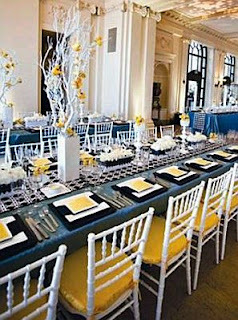 If you prefer something more subtle, this proposal is right for you, the yellow color is placed on the bonds chairs dressed. 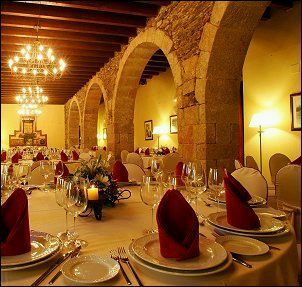 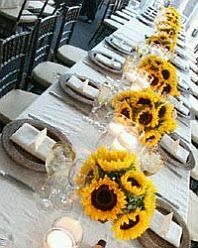 In this new image, the combination of lights, tablecloths, candles and yellow walls are complemented perfectly with red napkins. 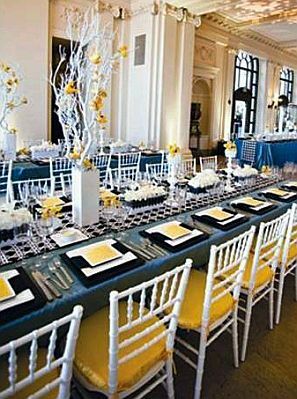 Beautiful color combination and although originally seems that looks too "yellow", actually use black accents can have a living off the charts. 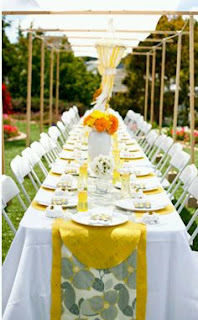 And if you have an outdoor wedding and want the details in yellow, this table, along with napkins, flowers and ribbons of the same color, are the perfect solution. 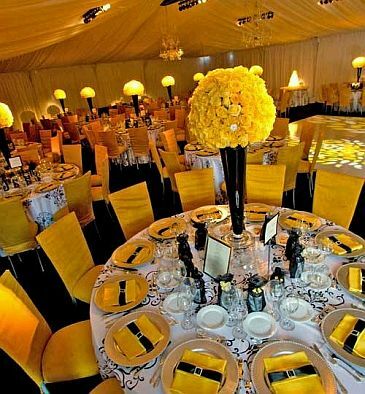 Another great example of how good is the combination of black and yellow, this time combined with white centerpieces and chairs. 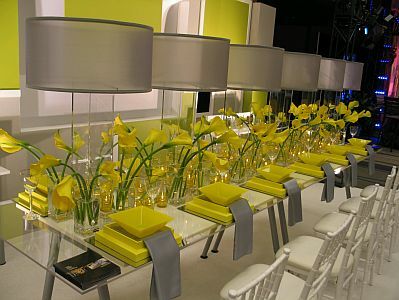 If you prefer to give the color using only flowers, these are very good. 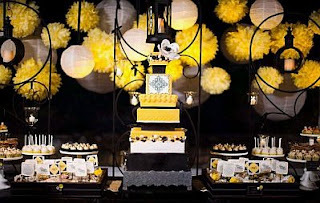 If you prefer a more dramatic, these bright yellow spheres are the detail indicated. 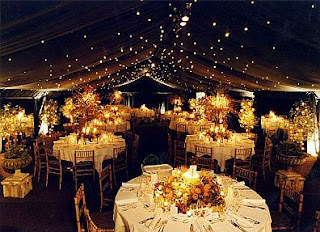 Another way to decorate the ceiling, with yellow lights and ornaments , bold and original details that give your wedding that unique style you wanted. Finally decorated with yellow lights on the ceiling, like stars, which combine well with lit candles and yellow flower arrangements. 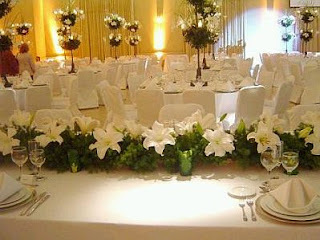 I hope you enjoyed these proposals.